Why are we so resistant to change? Here’s some reasons people resist change (and tips) on how to prepare for change in your company. 1. Loss of Control — Users don’t like to feel like they’ve lost control. Did your interface change suddenly without explanation? Make sure your guide your users through these changes and explain them thoroughly. 2. Excess uncertainty — User’s actually prefer to “wander in misery than to head towards the unknown”. If your product is an application, one way to alert users of changes is though the app store descriptions when they update. 3. Surprise, surprise! — Often times these changes happen with no warning. If you want the least amount of resistance from your users, alert them that a change is coming. Send a friendly email or write a blog and post it on your social media channels. 4. Everything seems different — Because everything is different! “Routines become automatic, but change jolts us into consciousness, sometimes in uncomfortable way”. Expect resistance at first, but your users will get used to it. 5. Loss of face —The people who liked and enjoyed using a previous version of your product might feel slightly defensive. This is because they enjoyed using it and dread the perception that they might have been wrong. They won’t feel this way for long after they’ve used your new version for awhile. 6. Concerns about competence — No one likes to feel stupid. A change brings about the question “can I do it?” Make sure you assure your users that their skills and previous mental models won’t become completely obsolete. 7. More work — As UX and software designers one of our goals should be to “reduce cognitive strain”. Make your new version as easy to use as possible. Include a great on-boarding experience and walk your users through what changes have been made. 8. Ripple effects —This one is for when a change is made and how to handle it internally. When you make a change in your service, application or software, it will affect other departments. Is your sales & marketing ready with a launch plan? Does your customer service know how to field questions from angry users about the change? Does your social media department know the appropriate protocols for responding to users? 9. Past resentments — Once you lose a users trust, its much, much harder to get it back. Has your product disappointed people before? You can’t always control the individual issues a user could encounter. Make sure they have access to appropriate tech support if they run into an issue. 10. Sometimes the threat is real — This one relates to “change”: in a holistic view. Organization changes can mean loss of jobs and zoning changes could mean loss of housing. Could taking away a feature mean a partial loss of your user base? This is where testing comes in handy. Set up some user testing, deploy an AB test and pay attention to where your users get frustrated. Now that I covered the psychological aspect of why people hate change, let’s focus on why people resist design changes? Did you hear what happened on Wednesday May 11th, 2016? (Gasp! )Instagram unveiled new branding and an updated application icon. The internet was angry! Have you ever noticed in situations like this — everyone becomes a designer? As usual, a giant tweet storm erupted almost immediately after users download the new update. The original icon’s skeuomorphic style had the benefit of making it feel tangible despite being pixels, and our initial explorations involved trying to modernize it as it was. We started with the basics, removed ornamentation, and flattened the icon. And we arrived at a brighter, flatter option — but was it better? Would we feel the need to do this again in a year? Change leads to innovation. Are we scared of innovation? This isn’t the first time an application icon has changed. Remember Uber’s redesign a few weeks ago? We were all so mad about that. Then what? We got used to it, like we always do. Here’s a great story from WIRED about “Uber’s Radical” re branding. When Air bnb rebranded a few years back, there were several comparisons to a specific part of the female body. See what top designers had to say about the rebrand. How about when Facebook makes changes? When Facebook makes a design change — you’ll hear about it all over your news feed. Friends threaten to “leave Facebook”, but rarely do. 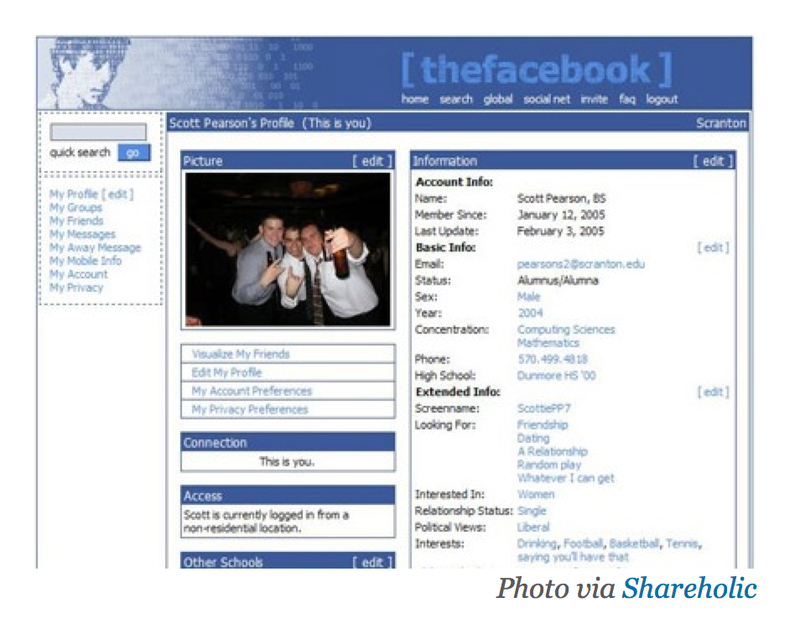 This is when Facebook was exclusive, except for a few universities. Notice the copyright on the bottom “a Mark Zuckerberg production”. This is what profiles looked like, before Timeline, chat and Cover Photos. You had to look someone up to see what they posted. A lot of new features we introduced this year. Status boxes were introduced and Facebook opened up to all users over 13. A mini feed and news feed were added. People could upload multiple photos, and the “share” button was introduced to the public. This redesign introduced a chronological News Feed that was similar to Twitter. The design was even more loathed than the previous redesigns — in fact 1.7 million users protested against it. The timeline became two column and image-heavy in this layout. Facebook wanted to emphasize creating a collection of images of your life — a digital scrapbook of sorts. This was the last redesign since Facebook went public. This is more of less what Facebook looks like today. There have been small incremental changes in the past few years, and each set of changes have been met with resistance. Then acceptance (because there’s always acceptance). It’s going to be OK! Changes happen all the time and as human beings we will eventually learn to be more accepting of companies and brands making changes— regardless if we like the design or not.